The Site Manager in FileZilla. Please make it so that using the site manager and "Only use plain FTP (insecure)" to work with Quickconnect... k thx! Greetings, Back again. I found the site manager and changed the setting as illustrated and clicked OK (I didn't change anything else in this window). Try clicking Connect instead of OK.
Ok, I clicked connect and I got one step closer. See text. Response: 220-You are user number 3 of 1000 allowed. Response: 220-Local time is now 14:03. Server port: 21. Response: 220-Local time is now 14:06. Server port: 21. I can see that Login authentication failed. If that's my BlueHost password, I checked it by logging on separately to it and it works, so I assume it was my new one. You must use the FTP username and password you got from your hoster when you signed up. Note that FTP login data is likely not the same as their general website access data. If in doubt, you need to ask them. But the good news: Apart from the missing login data server access seems to work now. OK, thanks, I'll tackle them. Just in the interests of closing what I learnt (in case some other newbie reads this and gets benefit from it). PS. After such a palaver, can you imagine what damage I can now do to my css file? Please note that the latest version of Filezilla is trying to connect by default to our server through FTP over TLS which is causing issues. As a work around you will need to either use a different FTP client (use the Filezilla version 3.7.1.1 which is found to be working at the moment.) or to switch the settings from Filezilla to use plain FTP connection or SFTP (File -> Site Manager -> New Site -> Encryption-> Only use plain FTP) . Please feel free to contact if you need any further assistance. What do I need to do to get the current version to work with plain FTP? Note that FileZilla only uses FTP over TLS by default if the server says it supports it. 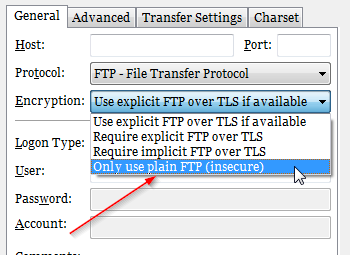 If there's a problem then it's with the server which isn't configured correctly for explicit FTP over TLS. I have no control over how a hosting company configures their servers. That being said is there a way to change your default to use plain FTP? If you don't mind the total lack of security you can force use of plaintext FTP in the Site Manager. Status:	Connection attempt failed with "EAI_NODATA - No address associated with nodename". This is what I am getting to after I made the update....Please help! "u71122767" is neither a valid server address (doesn't resolve to an IP) nor a valid IP. Are you sure that Hostname is correct?